Adam Holden has spent his entire career in the wine business, having discovered his passion at university. He worked for Majestic in Salisbury and London, before managing the company’s shop in London’s prestigious Vinopolis complex. 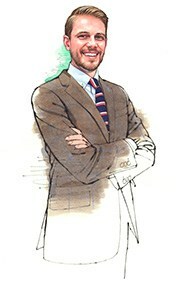 Adam joined Berry Bros. & Rudd in 2007 as one of the youngest London Shop Managers ever, aged just 26. After four years, he moved to his current position in the Wholesale division and now looks after the key accounts and develops new high-profile accounts. Berry Bros. & Rudd’s wholesale clients range from the Royal Albert Hall to country pubs, with trendy fast food places, farm shops and airport lounges in between. Berry Bros. & Rudd prefer to be sole suppliers to clients, in order to fully utilise the power of the brand. This also means that the department can offer a high level of support and services. Adam’s role is working with these clients: creating packages and proposed wine lists that are attractive to new clients, and supporting existing ones. He says: "I aim to structure deals to be attractive but lucrative!" Supporting clients – guiding wine tastings and training them about the products – gives Adam the opportunity to enjoy his favourite part of the job: meeting people and talking to them about wine. Recently, he was filmed explaining the wines chosen for Virgin Atlantic’s inflight service. He says: "I like helping people understand more about wine and, critically, how to enjoy it. It is very satisfying to break down misconceptions and misunderstandings and get people to a stage where they are happy to talk about wine themselves." Outside work, Adam enjoys carpentry and other DIY projects. Adam is always on the lookout for an interesting wine, so counts himself as having an open mind. However, he says: "My main vinous passion is red Burgundy, the best of which are capable of rendering one speechless; though sadly they are few and far between. Other particular areas of enthusiasm are Germany, Austria, Alsace, almost anywhere in Spain but particularly Rioja, and Sherry which I would drink all day long if I were allowed."